I top and tail them and then steam them. If we have lots or some left over then they are excellent cold in a lemon dressing or a french vinaigrette. Or you can dress them when they are still warm. Just lovely! Only thing is they become green when cooked…. 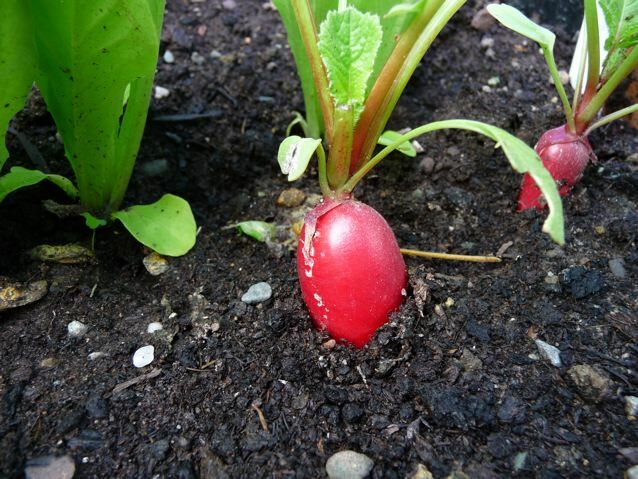 I like radishes too, they make me smile, seeing their bright red forms lifting out of the soil. These cabbages are BIG, we haven’t grown this sort before, usually we grow cavalo nero, the black kale which is more upright and takes up less horizontal space. We only have three of these and three of the pointy ones left. The rain of the last few days has made everything grow very fast. The little cucumber plant that Maureen gave us is producing flowers. No courgettes this year, they take up too much space, and we have earthed up the potato tubs, we’ve never grown those here either. But the star of the garden is my pear tree which has never fruited before and is covered in fruit for the first time in five years ! Aah, beautiful pictures, Joanna! 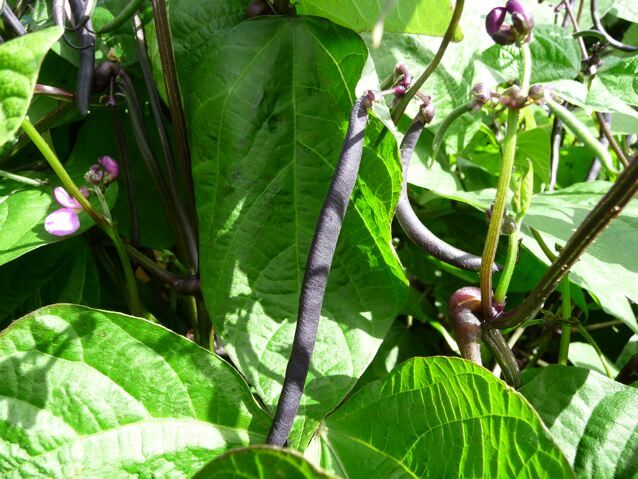 I do like the purple beans…we grew them 2 years ago (not much luck last year for some reason), and they did very well, and were more drought hardy than the ‘blue lake’ variety…although I notice yours are a dwarf type? Ours were the climbers. Great fun when they turn green in the pot! I know you grow on a much bigger scale than me Christine! Thanks for popping in…. .I think the pear variety is Concorde. I hope they are going to be good. Packham are lovely and the one we get most here in the UK which is Conference, and I can’t think why we have this particular variety, maybe it was what was there at the time…. Our veg bed is a raised one in a crescent shape but not very big, so we have to really think hard about what to grow in it…. I think about digging up the little lawn and making that into veg too, but then the dogs might complain. Possibly one day……. 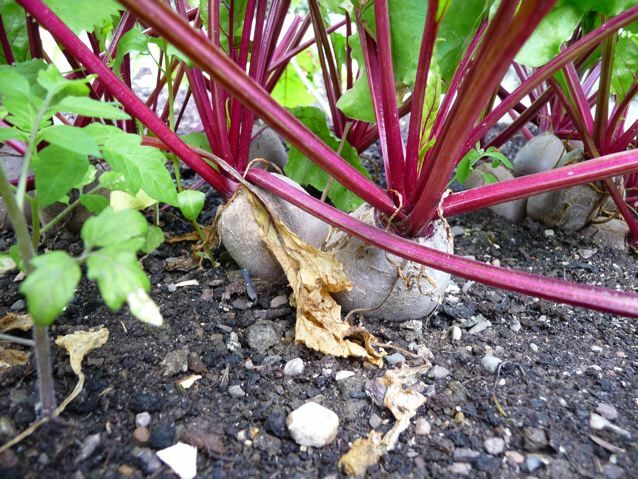 Glorious pics, Joanna, just what I need to see as we’re planting out our first garden beds, thank you! We made more beetroot dip yesterday to go with your cornbread – Pete put a little chipotle chilli in this time as well. 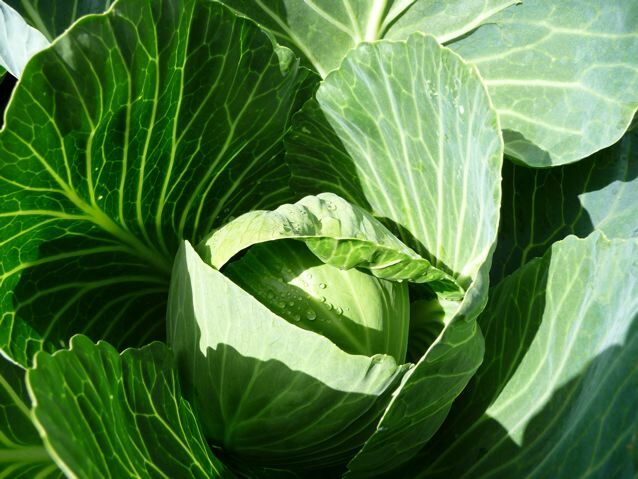 Cabbages really are the bargain of the garden and market, aren’t they? You just get so much from each one. No wonder the Buckets lived on cabbage soup in Charlie and the Chocolate Factory. One cabbage just goes so far. I bought a red cabbage from the markets weeks ago (for all of $2), and we’re still getting through it – sharing it with the chooks as well, who adore it. 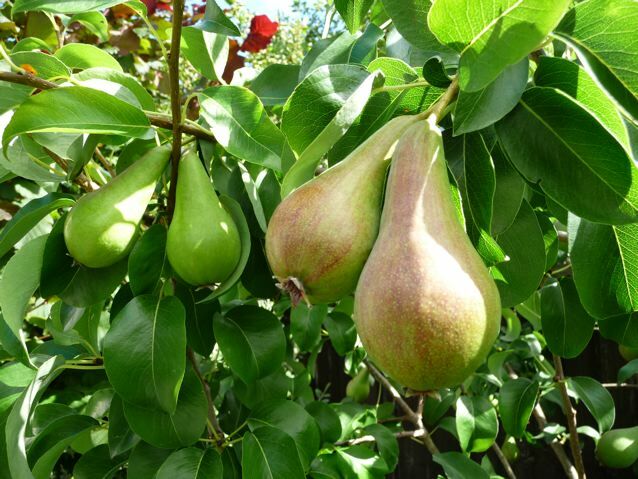 Your pears look splendid – I’m not a pear lover, but I’d eat those! No idea if these pears will be nice or not as fresh eating fruit, but I really like poached pears in marsala (perfect dish for hard pears!) and there is a very traditional dessert called poire belle Helene that I have always fancied making. And I was just reading a recipe for a pear bread, which I might try sometime. Those cabbages belong in a proper veg patch, not my little raised bed. Red cabbage is nice braised with fruit, apples or cranberries if they are in season, orange juice, cinnamon, pepper, brown sugar and some onions at the beginning. I used to have a glorious big garden, but as my helpers and eaters moved out to their own lives, I’ve planted grass over the garden and just kept my herb area and flower beds. I am quite dependent on Farmer’s markets and friendly neighbors for fresh vegetables. There really is nothing like growing our own, though (sigh).